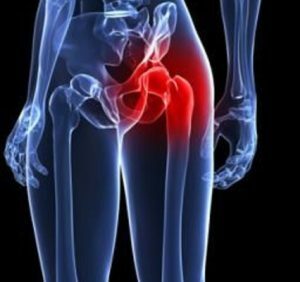 Hip impingement is a common complaint that we see in CrossFitters, weightlifters, and powerlifters due to the demands of their sport that push the hip joint through full ranges of motion repeatedly. This condition can be quite difficult to treat and is often mis-managed in the medical world. This week I’m excited to have my friend Sarah Haran, a hip impingement specialist in Seattle, WA, join me as we share our top tips for treating hip impingement. Understand how common this is! The first key to treating hip impingement is to understand the frequency at which many of the tissue changes found via MRI are in people with NO hip pain or limitations. A 2012 study actually found that 69% of asymptomatic individuals had hip labrum tears! 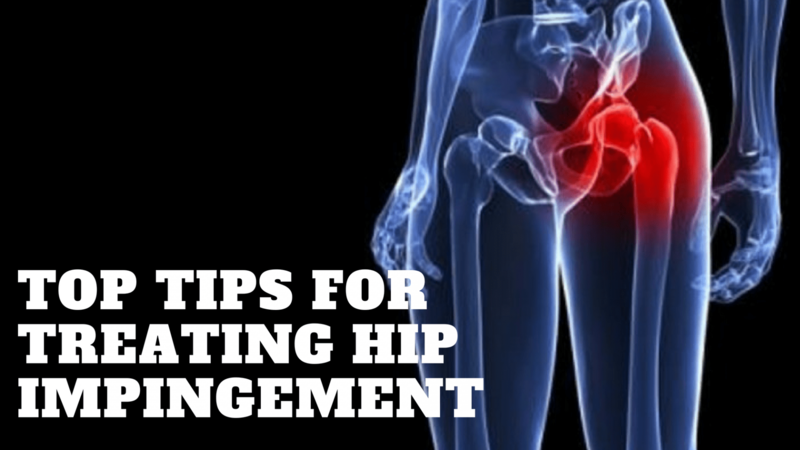 This should be encouraging for those that have hip impingement symptoms. If others can have the same tissue changes that you do without pain it often means we can use the following principles to calm down irritated tissues to allow you to return to the activities you want to be doing! Next, we believe it is incredibly important to TEMPORARILY alter your daily activities to minimize the amount of irritation you create on already sensitive tissues. I often explain this injury as a bruise that is continually poked. Until we stop repeatedly stressing the tissues to allow irritation to begin to calm, we can expect healing to be significantly slowed. At times this includes altering or removing squat variations from workouts (discussed below), removing stretching of the hip flexors (see below), and minimizing sitting & sedentary activities that make the symptoms worse. Although we are altering activity, it is very important to note that we are encouraging exercise, particularly strengthening, as this will help make symptoms better. For actual labrum tears and bony impingement (see this piece for the differences: http://www.arrowptseattle.com/hip-impingement/), you may have to make some permanent alterations or sport changes. But in general, if we can balance muscle strength, balance motor patterns and emphasize certain mechanics over others, many people will see decreased symptoms and functional improvement. Note: this section gets pretty technical for those not medically trained. The summary of it is that stretching the hip flexors rarely helps with this condition. If you have hip impingement symptoms you’ve likely been stretching your hip flexors like crazy and haven’t seen any improvements. So, if you aren’t getting better, then we suggest just go ahead and stop! More often than not, the hip joint is held in extension in those dealing with hip impingement. Extension is the position where the femur (leg bone) is posterior to (behind) the body. When the femur is posterior and the hip is in extension, we see that the femoral head is anterior (forward) relative to the midline of the body. Anterior positioning of the femoral head can also happen in sitting. Though the hip may be flexed (with the femur in front of the body), people most often sit with the majority of their weight in the back of the pelvis, placing the pelvis in a posterior tilt (tucked under). This could be considered relative hip extension. 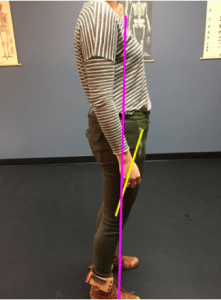 In essence, people tend to both stand and sit with their hips in a position which encourages an anterior femoral glide consistent with hip extension. A person with weakness in the hip muscles, excessive mobility in the passive (non-contractile) structures of the hip (namely the joint capsule and ligaments), or the anatomical bony structure to allow this, may have an increased propensity for an anterior positioning of the hip joint in sitting and standing. In this sense, they are already placing undue stress on the front of the hip, including the hip flexor muscles. So as we have noted above, a tight muscle is not necessarily a short muscle. So, is the psoas then taught and weak? Typically. We need to stop stretching and start strengthening (Kalisvaart & Safran). How do we do this? And what other areas do we need to focus on building strength? Downtrain the TFL/rectus femoris – in this video you will see Sarah performing supine hip flexion while feeling her TFL muscle in the anterior hip. She is using this as self feedback to keep the TFL as relaxed as possible during performance. 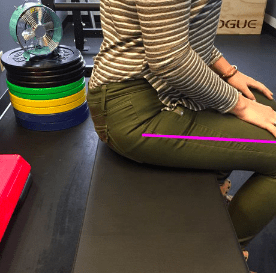 From there, we can progress to Eccentric training of psoas using this band assist drill, followed by progressing to the psoas march discussed in this article. Glute Uptraining often becomes important. Exercises such as hip thrusts, and single leg sit to stands work great as well as bridges with a posterior pelvic tilt. 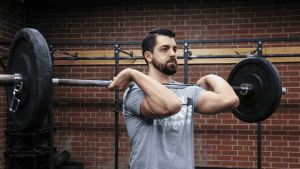 In the weightlifting / CrossFit population, squats are often one of the most common painful triggers in individuals dealing with hip impingement symptoms. As mentioned above, we want to reduce the frequency at which we irritate the anterior hip tissues BUT stay active. These alterations can help with that. 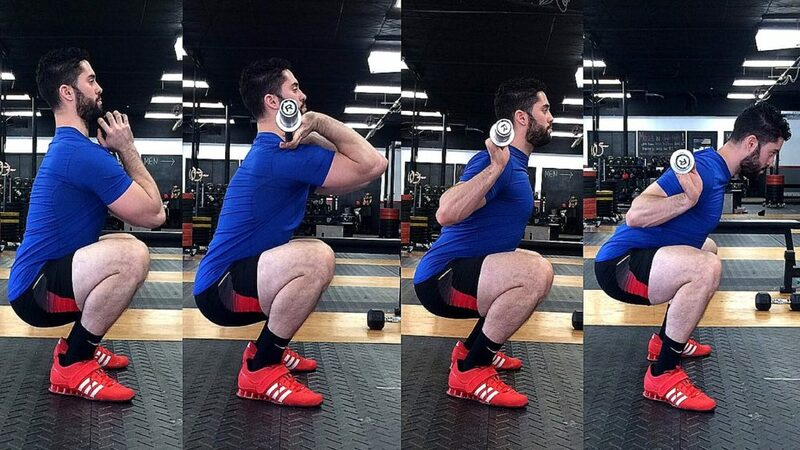 First, different squat variations require different amounts of hip flexion. More hip flexion means the potential to irritate the anterior hip more. So for the most part, squat variations with a more upright torso are a better choice in individuals dealing with hip impingement. See the below picture demonstrating how different squat variations can alter hip flexion angles. Goblet squats and front squats tend to be my first choice for squat variations in this population. Next, anything we can do to increase dorsiflexion will allow a squatter to push his or her knees further forward in a squat and decrease the hip flexion demands of the movement. For help with this, see my Ankle Dorsiflexion article or consider using a heel lift or weightlifting shoes. Finally, remember that everyone’s skeletal anatomy is different. Some folks will have a wide stance, others vary narrow. Some athletes turn their toes forward and others more outward. As long as the mechanics are clean and the movement pain-free, none of this is bad, per se. In my opinion, a good squat involves heels remaining on the ground, a neutral spinal position (not over arched or rounded), and knees tracking over toes. This said, I have witnessed some hip pain with squatting as a result of an athlete being coached into squatting with feet too wide or too narrow. Similarly, athletes are often instructed to keep toes forward when, though that helps with creating torque during the squat, it is not ideal for everyone and fails to recognize that many people who toe out slightly can still produce that same torque, especially when cued to do so. We need to optimize every athlete’s squat as much as we can for the best mechanics possible, but we also need to recognize the anatomical (typically bony) structures which might limit us and which might become irritated if we cause undue stress to them. Regardless of these points, just because you have pain with squatting doesn’t mean its bad for your hip. It may just need to be tweaked. More here for why most everyone should be squatting. One final tip for treating hip impingement is to use isometrics: muscle contractions performed without movement. A number of different musculoskeletal conditions have been shown to have a pain-relieving effect after utilizing isometrics. How I typically approach this is having the athlete identify painful or irritating positions. We then perform the same movement staying just shy of where the symptoms are provoked and then hold. 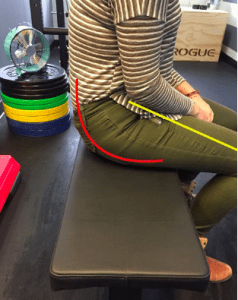 For example, if an athlete has anterior hip pain at parallel in a squat, we squat just above parallel and hold for a period of time (usually 5 sets of 10-45 seconds). This lets the athlete work on positioning & control while also creating an analgesic effect on irritated tissues. This becomes part of their home exercise program and they will quickly see that the range of motion they can move through without pain is increased. For clinicians wanting to know more about Sarah’s views on treating hip impingement, check out this podcast interview. Want to dive deeper? Join our discussion on Facebook! Zach Long is the director of TheBarbellPhysio.com. To schedule an appointment with Zach, visit THIS PAGE.